Learn how to make butter at home in just a few minutes with cream, a jar, 2 marbles and some “muscle”. Recently we made homemade butter. It was so easy to do, and the results were delicious! If you’ve never made butter from scratch, this is an experiment you have to try at home or in the classroom with your kids and students! 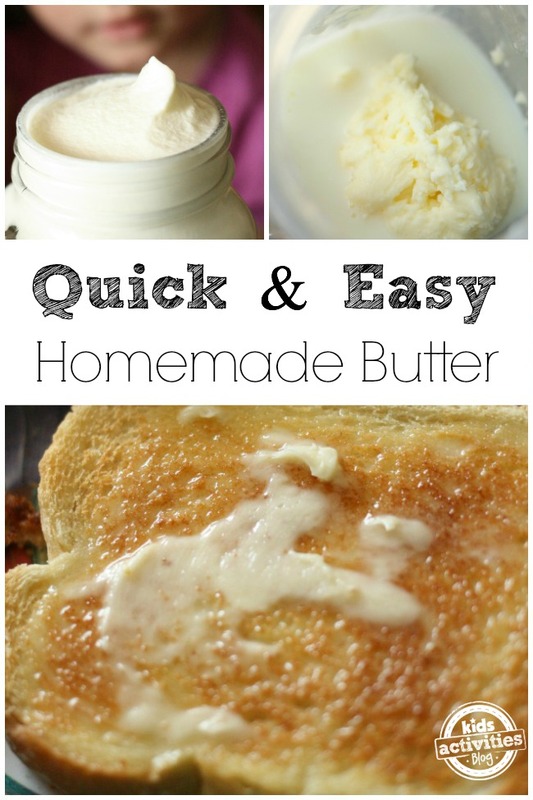 You won’t believe how fast and easy it is to turn a cup of cream into a batch of fresh and tasty homemade butter! All we used as a clean jar (the Ball Jars are perfect for this), glass marbles, heavy whipping cream, music, and man-power. 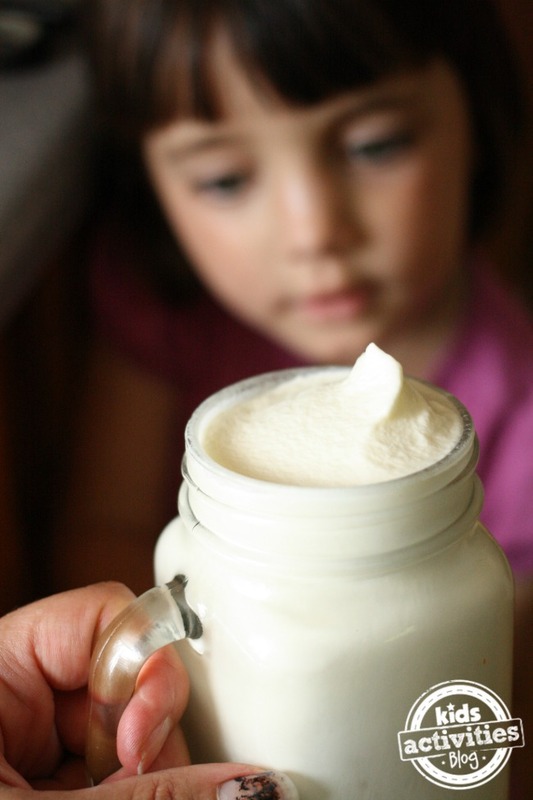 We started by filling the jar about 3/4 full of cream. We added two marbles to help with mixing and put the lid on. I double checked to make sure that the lid was on REALLY tight. Then we put on some fun music and we danced around while we shook the jar. It doesn’t really matter how you shake or how hard you shake them but you need to keep things moving. It’s best to do this with two people so you can trade off and let your arm rest. After 5 minutes, we had a nice whipped topping. I talked a little bit about how butter is made. I explained that basically cream is full of little fat globules but they are all scattered through the liquid. Once the mixing starts, those fat globules find each other and they start to stick together. 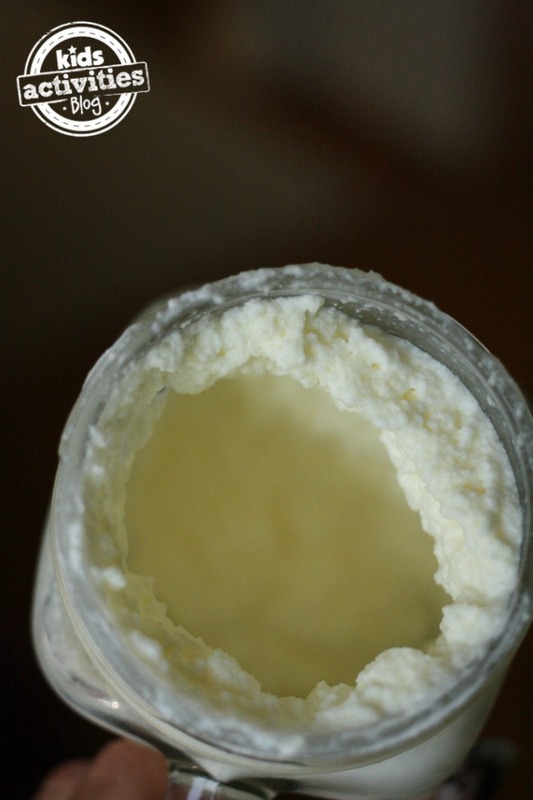 As they stick together, the cream separates into 2 parts – the fat globules (butter) and the liquid (buttermilk). As more and more fat globules stick together, a lump of butter begins to form in a pool of buttermilk. After about 10 minutes of shaking and dancing, we could hear a distinct “thud” as a ball of butter had formed in the jar. 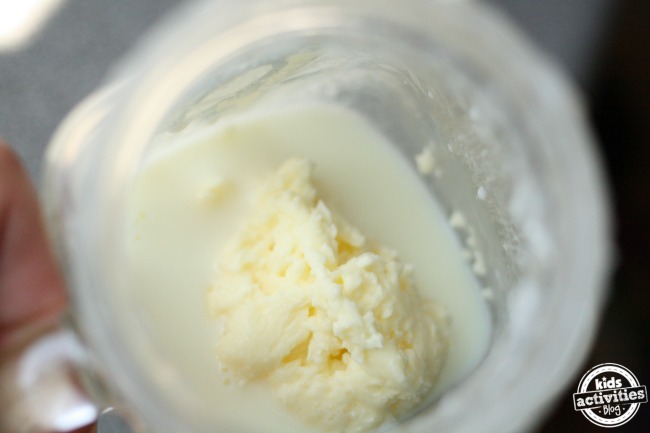 We drained off our liquid and were left with a beautiful batch of fresh, homemade butter. It’s a good idea to rinse the butter under cold water, kind of kneading it with your fingers to remove all of that buttermilk. Our fresh, butter tasted delicious as it was, but you could add a pinch of salt to make if you’d like. 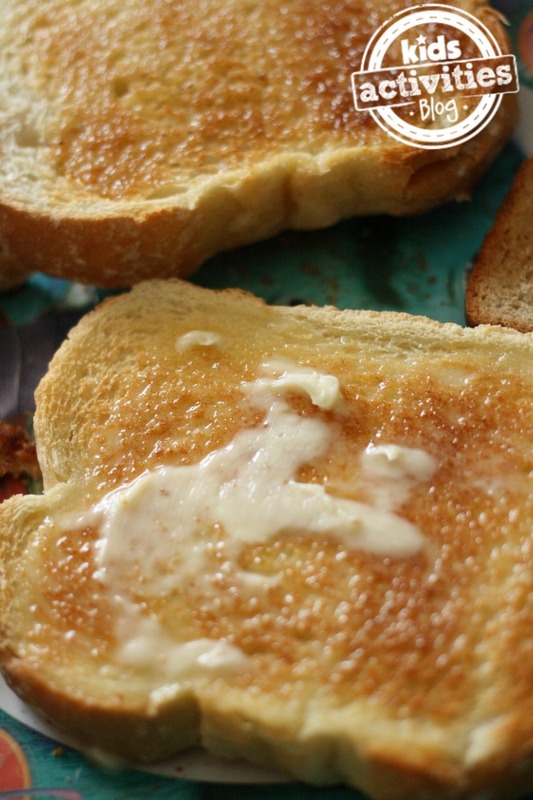 It’s so yummy on toast as an after school snack and it’s a great learning activity to do with your kids. Try it at home or in the classroom or even while camping or traveling. Check out our KOACampfire community for more ideas of things to do and ways to entertain kids while outdoors. We love making butter as part of our farm breakfast during farm week. Back in the day, when I had an after school restaurant job – I used to make fresh butter for the house made sourdough buns. I can taste them right now. I think my young niece and nephew would appreciate this recipe. Their dad owns a few restaurants and they definitely have the foodie bug in them. We just made butter this week! Reese LOVED the fact that it was his creation…we pressed our butter into mini-cookie cutters so his was a bird-shaped pat of butter! This is one of my favorite things to do with kids (right up there with making ice cream by rolling the ball-shaped ice cream maker around). But I have to say, your story about the fat globules bumping up against each other and making friends is genius! I’ll definitely be incorporating that the next time I make butter with kids. For a not-as-fun-but-equally-yummy way of making butter: Throw cream in a food processor, turn it on, set timer for 15 minutes, make some biscuits, come back when timer is finished, slather said biscuits with fresh sweet cream butter. Delish! Homemade butter is on my to do list. 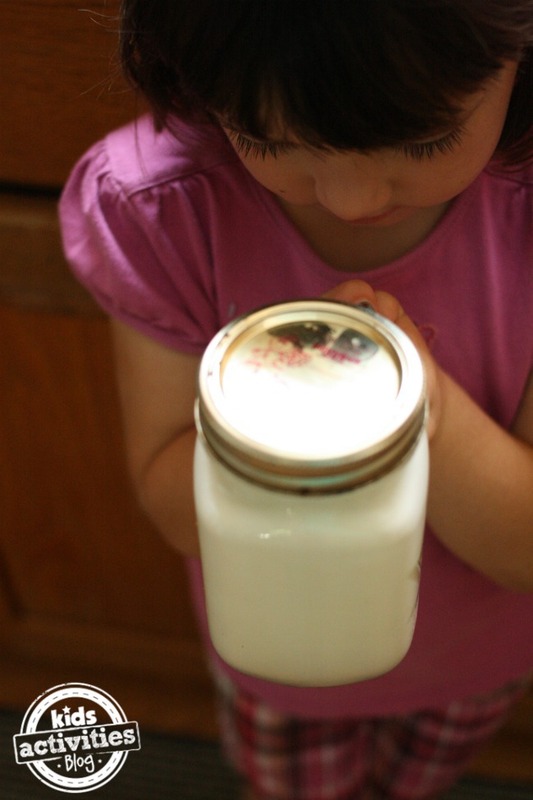 I can’t wait to be able to go to the farm to get some raw milk and separate the cream to use that for the butter. I can taste it! What a great idea to do with kids! Love it! Your little one is just adorable. 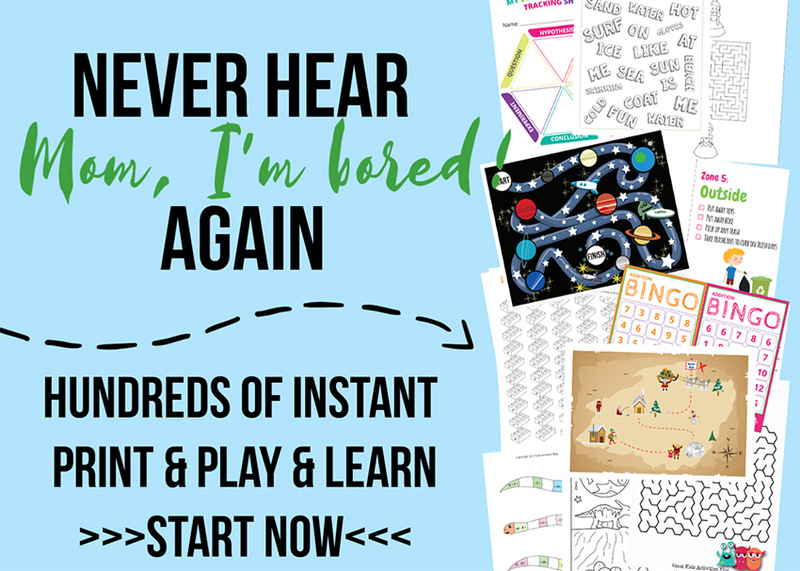 This is a great activity for a child, and a lot of fun for adults as well! Thank you so much for sharing with Full Plate Thursday. Hope you are having a great week end and come back soon! When my oldest was in 1st grade, they made butter with the whole class taking turns shaking, as part of their Thanksgiving feast. That was when I learned what buttermilk is. Lol I think I’ll have to try this with my kids, they’d love it.